Malibu Shark Attack, a duo feating nerdcore rapper Tribe One, deliver an anthem that helps focus your motivational energy...and I reveal what I've been doing with mine. If you’ve been following this series of content, you’ve probably noticed a theme. Excluding last week’s piece on Green Day’s Basket Case, each song has focused on developing the right mentality to realize your potential. I’ve picked this approach because I’m currently on that journey. Recent experiences (“recent” being the last couple of years) have challenged me emotionally because they didn’t challenge me in any other way. In that tension lies my internal conflict. How important is being challenged in life? What if you have to choose between being challenged and being financially stable? What if in being challenged, you bring ridicule and embarrassment upon yourself? In Doing It Wrong, Malibu Shark Attack shift our perspective on these questions. Often in our culture we emphasize the “end” of things. As kids in school, the bottom line is the grades you receive. As adults at work, the bottom line is your salary (or the quantitative “value” you add to the company). As adults in social situations, the bottom line is your “place” in life (“place” being the solution to a complex non-objective formula where the variables are wealth, material possessions, and social relationships). All of these standards are end-goals. None are concerned with how you get/got to that end-goal. Again, the exact point isn’t that he wanted to be a hero. It’s that he wanted to be like Batman–heroic by doing the deeds he does. Perhaps intentionally, perhaps not, Tribe One has hit on an odd, harmful rite of passage we put our children through. Before they understand anything about the world, we make them say what they want to do with their lives. I still remember what I said for my answer to that question. I wanted to be the first man on mars. Why did I want to be that guy? Because I loved reading science fiction. Now I know, like Tribe One, that I don’t want to literally be Batman on Mars, I want to write about an awesome guy taking his Bat-Shuttle to the red planet to figure out its mysteries. I understand that the day-to-day life of an astronaut wouldn’t be as appealing to me as the day-to-day of the life I have now. Except when I was young, I wasn’t asked to take that part of a job into consideration, and not doing so still haunts me to this day. In these lines he gets to the heart of the problem that focusing on the end goal creates–the juxtaposition of “dreams” and “safety” as opposites. If the end becomes the reason you do things, then you’re not focusing on what you’re doing. If you’re not focusing on what you’re doing, you’re not thinking about what you want to do. If you’re not thinking about what you want to do, you’re ignoring your dreams. It’s a strange transitive property of perspective that you only understand the reality of until you experience it. That reality is the latter half of the second verse. Tribe One had two choices: keep doing what he was doing or rap. The reason he chose to rap is because when he wasn’t rapping, he was unhappy with his life. At some point, that unhappiness began to outweigh the fear he’s experiencing now, so he quit his job to do, as he says in the hook, what he wants. The third verse of this song pretty much repeats the sentiment encapsulated in this hook–pride in expressing your individuality. You see, that long line of transition of traits above continues further. If you’re ignoring your dreams, you’re ignoring yourself because you are your dreams. You’re what you think, value, want, admire, celebrate, etc. By focusing on the end, on being safe, you’re ignoring your mind in favor of social acceptance. It’s why in the first verse Tribe One changed his answer from Batman. It’s why in the second verse people expected him to set his dreams aside. Those expectations and the tactics that accompany them are what makes the hook the most important piece of this song. I can’t tell you how many projects or ideas I’ve abandoned simply out of the fear of being laughed at, ridiculed, hated, embarrassed, mocked, or insulted for having created it. It’s certainly not one of my best qualities, but it is one of my qualities. Why do I hold this fear? On some level I privilege what other people think over what I think because I have a very hard time finding people who agree with me. I like stuff that no one really likes. I approach things in a way that no one really does. Because of these facts, I’m continually met with push back and it wears me down. How often can you stand in opposition to the crowd and still believe you’re right? The answer this song provides to that question is what makes it so powerful. “Who cares if you’re doing it wrong?” The point is you shouldn’t care because you’re doing what you want, what your mind thinks is best. It’s not about the crowd, it’s about you, trying your hardest to do what you want, not focused on the end but on the doing. “What are you doing you?” you ask. You mean, besides writing these analytical essays on songs that inspire me? Good question! I’ve been working on some songs of my own, and starting next week, the next five Track Tales will be about those songs. You’re just full of great questions today. 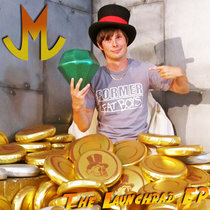 I’ll be officially releasing my first music next Tuesday–a Nerdcore rap EP called The Launchpad EP. Yup, I have no idea if I’m doing it right. I’m just doing it (thanks, Nike). Let’s see if this is the start of a crazy journey or just another excuse for people to call me names.